Jennifer Clark, associate professor of public policy and director of Georgia Tech’s Center for Urban Innovation, is shown in Georgia Tech’s Clough Undergraduate Learning Commons. At its core, smart cities research is all about data — on how people move throughout the city, how they consume energy, and much more. Georgia Tech’s smart cities strategy aims to understand the different forms of smart cities data and then find ways to both curate that data and make it available for innovative projects. A first step was seeding a set of exploratory projects focused on city data as well as data generated on the Georgia Tech campus. Matthew Swarts, Brian Stone, and Noah Posner, all research faculty in Georgia Tech’s College of Design, are designing, building, and deploying environmental sensor stations alongside the current Georgia Tech Climate Network. The stations are solar powered and report real-time data on wind and humidity. Taken together, this sensor network provides micro-climate data across campus, informing efforts to combat the urban heat island effect and conserve energy. Christopher Le Dantec, an associate professor in the School of Literature, Media, and Communication, is prototyping and deploying specialized sensors to track cyclist stress, integrating information about noise and environmental pollution with proximity sensors to capture information on why cycling in Atlanta can be a harrowing experience. But not all data comes from sensors. Clark and Thomas Lodato, who is a postdoctoral fellow in the School of Public Policy, are poring over the city of Atlanta’s budget and fiscal data to better understand spending and accountability issues, creating techniques for automated analysis and greater transparency. Faculty members are also exploring how to aggregate smart cities data in virtual environments. John Taylor, Frederick Law Olmsted Professor in the School of Civil and Environmental Engineering, aims to manage urban scale data through virtual reality. Streaming reality data “creates exciting opportunities for real data analysis and contextualization, as well as testing simulated ‘what if’ scenarios,” he explained. Taylor’s research found a natural ally with Dennis Shelden, associate professor and director of the Digital Building Lab. Shelden and his team developed a city data aggregation, visualization, and analytics platform that includes 3-D virtual reality and augmented reality interface capabilities. The data projects support Georgia Tech’s wider plans for creating, building upon, and applying smart cities data for research, operations, and implementation. “It’s important to think about the data collection, storage, and analysis in an integrated way so a city can benefit from having multiple types of sensors instead of being tied to one vendor,” said Margaret Loper, chief scientist at the Georgia Tech Research Institute’s (GTRI) Information and Communications Laboratory. Civic engagement is another important aspect of smart city data strategy. Carl DiSalvo, an associate professor in Georgia Tech’s School of Literature, Media, and Communication, is leading a series of design workshops where community residents meet with university researchers, city officials, and urban planners. These are interactive sessions where participants use visual tools, create maps, and act out scenarios. The goal is for residents to consider services they might want to result from the data collection — and voice any concerns about privacy and security. Working with Missouri University of Science & Technology and other universities, CEE researchers are converting bridge inspections from manual to automated processes via drones and advanced data technologies. This should enable less costly and more frequent inspections, resulting not only in better decisions for regular maintenance but also faster recovery after a disaster. CEE researchers are evaluating the impact of city parks, looking beyond their recreational role to see how they improve transportation, economic development, health, and resiliency. For example, the city of Atlanta saved $16 million by constructing a water retention pond in its Fourth Ward Park, which eliminated the need to install tunnels and piping to reduce flooding in nearby areas. “We’re trying to show urban parks are just as important, if not more so, than traditional infrastructure because of their multiple benefits,” said DesRoches, pointing to increased job creation, improved air and water quality, reduced traffic, and lower health care costs. In contrast to anecdotal correlations, his team is using hard-core data to quantify such positive impact. “The availability of data has really exploded, especially in regard to air quality, traffic, and people’s movement patterns,” DesRoches said. 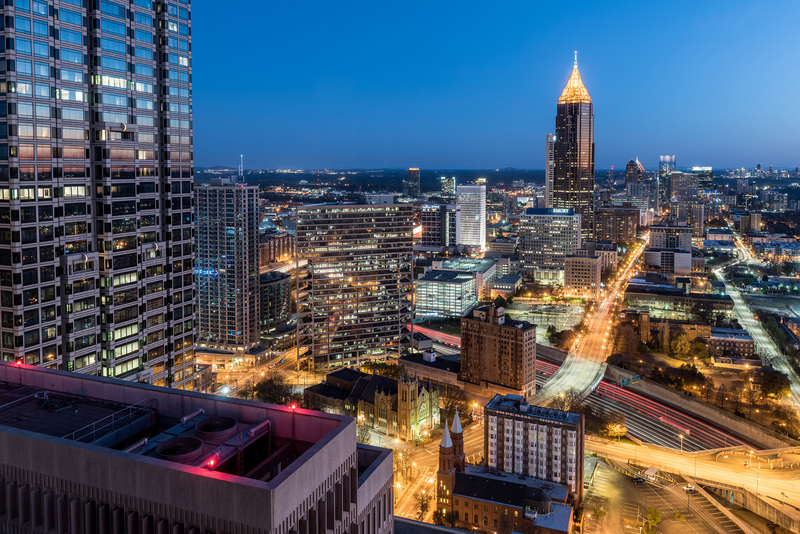 Georgia Tech, Georgia State University, and the city of Atlanta were among the first city-university partnerships to join the MetroLab Network, which is part of the White House’s Smart Cities Initiative. Announced in September 2015, the federal initiative earmarks more than $160 million to fund new technologies that address urban challenges. With $12 million in funding from the National Science Foundation, a consortium of scientists, industry leaders, and policymakers from across the United States and other countries are striving to create cities that are not only highly functional, but also healthier, more equitable, and more desirable places to live and work. The Georgia Tech Research Institute (GTRI) is working with the Georgia Tech Police Department to bring a wide variety of data — drawn from vehicle sensors, video cameras, call centers, floor plans, and more — into a common operating picture. This geographic-based interface shows the location of different sensors across campus and enables police to dive deeper and see what data the sensor is viewing or collecting at the time, explained Margaret Loper, chief scientist at GTRI’s Information and Communications Laboratory. An initial prototype is now being tested by police. The next step will be adding more data sources and improving the interface. In a related project, GTRI is conducting research with the College of Computing to enhance campus video cameras with fog computing — ­de­centralized computing at the edges of a network. Fog computing enables real-time analysis before data is sent to the cloud, resulting in less data being sent, increased transfer speed, and fewer security risks. Although current camera systems can retrieve and review data to see what occurred at a certain location, they don’t have the ability to communicate and track activities in real-time across cameras simultaneously. Margaret Loper, chief scientist in the Georgia Tech Research Institute's Information and Communications Laboratory, is shown on North Avenue where Georgia Tech and the City of Atlanta jointly work on smart city innovations. Better data is also helping find new ways to approach energy distribution. Urban areas account for more than 70 percent of global energy usage and about 50 percent of greenhouse gas emissions, according to United Nations statistics. Traditionally, energy demand has been estimated by looking at occupancy of individual buildings or population demographics, points out Taylor. “Yet there’s a disconnect between energy use at the building and city level — in fact, people have a fairly narrow understanding of their overall energy use,” he said. To predict energy demand more accurately, Taylor’s team is analyzing how people’s movements and activities fluctuate over the course of the day. Such spatiotemporal trends once were impossible to study because data was sparse, available only from surveys and monthly energy bills. That has changed, however, due to advances in technology such as cellphones with GPS data, smartcard commuting data, and location-embedded data from online social networks. “The things we carry around in our pockets every day can now be leveraged as sensors,” Taylor said. A vertically integrated projects class led by Georgia Tech Research Institute researchers Lee Lerner and Mike Ruiz has been researching sensors and their broader smart city applications. Using data from Chicago and London, Taylor’s team has shown a correlation between mobility and fluctuations in gas and electricity consumption across the cities. The researchers are now gathering data to study fluctuations in energy use across Atlanta. There’s also a tie-in with resiliency and how natural disasters affect mobility in urban areas. Using data from social media, Taylor’s team is trying to create a framework that not only can communicate real-time conditions for improved evacuations, but also predict the location of displaced people after a natural disaster. As cities sprawl larger, getting around quickly and safely becomes even more difficult, particularly from a sustainability perspective. Public transit is attractive because it reduces gasoline consumption, CO2 emissions, and roadway congestion, but transit authorities are challenged by low ridership. Improving service is one way to fill seats, and Georgia Tech researchers are developing new ways to avoid “bus bunching” (when transit vehicles are delayed and end up following each other in close proximity). With that in mind, a group led by John Bartholdi in Georgia Tech’s H. Milton Stewart School of Industrial and Systems Engineering has created a “self-equalizing” system to keep campus buses spaced more evenly. Via GPS sensors, the system constantly reports each vehicle’s location to a central server. When a bus reaches a stop, an algorithm compares its headway with the trailing bus and then sends a message to the drivers’ cellphones to let them know when to depart. Taking this idea to another level, Kari Watkins, Frederick Law Olmsted Associate Professor in CEE, and recent Ph.D. graduate Simon Berrebi, have devised a real-time dispatching method now being tested on the Atlanta Streetcar system. Similar to Georgia Tech’s buses, the system also operates on headways rather than fixed schedules. “Yet instead of looking only at the most recent vehicle, our algorithm uses real-time predictions for all vehicles on the route, which increases accuracy when multiple vehicles are running on the same route,” Watkins explained. Kari Watkins, associate professor in Georgia Tech’s School of Civil and Environmental Engineering, and doctoral student Simon Berrebi are helping cities improve their ­transit services. Another hallmark of the system is a barometric sensor kit developed by Russell Clark, a research scientist in Georgia Tech’s School of Computer Science, and Bill Eason, a research scientist in IPaT. The kit tracks elevation changes to determine each vehicle’s location, thus solving the “urban canyon” problem, where streets with tall buildings can block GPS signals. “Even if the vehicle isn’t getting a great GPS signal, the information from the barometric sensors helps us to determine the vehicle location,” Clark said. Beyond operational improvements, simply giving people better information about what’s going on can work wonders, points out Watkins, co-creator of OneBusAway, a phone app that provides real-time information about the arrival time of buses and trains. Launched in 2008, OneBusAway and rebranded versions are now used by a dozen cities. Researchers continue to make improvements to the open-source app and add more information for riders, such as trip planning. OneBusAway also collects information to evaluate the impact of real-time data on ridership. In Seattle, 92 percent of riders reported higher satisfaction with public transportation, and in New York City, annual ridership increased by an estimated 8 million. “Real-time data enables cities to provide riders with improved service without necessarily adding more buses or trains on the street,” Watkins said. In another project, Watkins and Le Dantec have created an app to help city officials improve infrastructure for bikers. Introduced in 2012, Cycle Atlanta enables cyclists to record their trips on smartphones in real time, reporting any problems they encounter. Jon Sanford, professor in the College of Design and director of the Center for Assistive Technology and Environmental Access, is helping improve mobility for older residents. Le Dantec points to a community engagement playbook he has created for five neighborhoods on Atlanta’s west side, a year-long project with the city of Atlanta, Atlanta Housing Authority, and the Westside Future Fund. The first of its kind in Atlanta, the playbook is geared to help city personnel, community organizations, and residents work together better on planning and development projects. One way to make urban areas more accessible for older residents is to provide the right kind of environmental information to guide them. “It gets people over the hump of not venturing outside because they fear that an uneven sidewalk might cause a fall or a missing curb ramp might make destinations unreachable,” Sanford said. With that in mind, Sanford’s team at CATEA and the Center for Geographic Information Systems (CGIS) are developing a software app that helps people plan routes based on their abilities and personal preferences. Known as ALIGN (Application for Locational Intelligence and Geospatial Navigation), the app includes more than 50 factors, ranging from accessibility issues, such as curb cuts, walkways, and traffic signals, to things like avoiding high-crime areas, uphill climbs, or unshaded sidewalks. An initial prototype has been successfully tested, and the researchers are now incorporating more real-time data about traffic and weather conditions as well as crowd-sourced information on actual route conditions. Although the current app uses GIS data from Atlanta, it could be deployed anywhere. In another twist on smart cities, Gregory Abowd, a Regents' Professor and J.Z. Liang Chair in Georgia Tech’s School of Interactive Computing (IC), is investigating how digital footprints can provide insights into wellness and performance. The project, known as CampusLife, builds upon an earlier study with Dartmouth College students. During a 10-week period, a continuous sensing app on participants’ smartphones collected data about their location, physical activities, eating habits, and apps they were using. This data, as well as answers students provided to occasional survey questions, was then used to correlate students’ academic performance with mental health and behavior. Expanding on this, Abowd, along with IC chair Annie Anton and assistant professors Munmun DeChoudhury and Lauren Wilcox, have organized a consortium with Dartmouth and other universities to collect more data over longer periods of time. The goal is to create a sort of virtual wellness coach. By looking at participants’ interactions with mobile and wearable technology, social media, and the environment, along with self-reported data, the researchers hope to create software that reflects back actionable information. For example, if participants report feeling stressed, the system could help them understand whether they are experiencing good stress or bad stress and what to do. Another objective is to help students take advantage of various university services available to them. “By having a device and infrastructure that knows a lot about the person, appropriate guidance can be triggered at the right time and place,” Abowd said. Pilot studies are being conducted as the researchers strive to standardize software tools and research protocols that can be easily repeated. Another task is evaluating the right mix of passive and self-reported data to collect. Over the next two years, the researchers hope to conduct large-scale studies and build a bigger picture of students’ interaction with the campus. Besides helping individuals, this could be used with different cohorts, such as engineering majors versus business majors or second-year students versus first-year students. “We want to understand the behavior of a group and then reflect information back so they can achieve desired outcomes,” Abowd said. T.J. Becker is a freelance writer based in Michigan. She writes about business and technology issues.